Come see the beautiful used 100' Fort Lauderdale Boat Show Hatteras! : Atlantic Yacht & Ship, Inc.
Come see the beautiful used 100′ Fort Lauderdale Boat Show Hatteras yacht! In the market for a used Hatteras yacht? Then be sure to come by this 100′ Fort Lauderdale Boat Show Hatteras Yacht that Joe Marino has for sale at the show! In the first place, this Fort Lauderdale Boat Show Hatteras yacht is known as “Nicole Evelyn”. Equally important, she was launched in 2002. However, this yacht is in beautiful condition and ready to cruise. As can be seen by her new air conditioning chillers and handlers, this yacht has been expertly maintained. In fact, she has all new 2016 Raymarine electronics throughout. Furthermore, she boasts a new EZ2CY eisenglass enclosure! The care put into this 100′ Fort Lauderdale Boat Show Hatteras is immediately evident. As soon as you step on board at the show you will love her recently refurbished exterior teak. This yacht features a four stateroom layout with cherry joinery throughout. Back on the main deck, she has a huge country kitchen which is perfect for the American market. This large size trend continues on the fly bridge which is expansive. Plus, your crew will be perfectly comfortable as their quarters are also very comfortable. 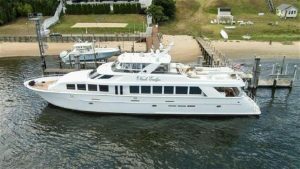 For more information or to see this Fort Lauderdale Boat Show Hatteras at the show, be sure to contact Joe Marino today!